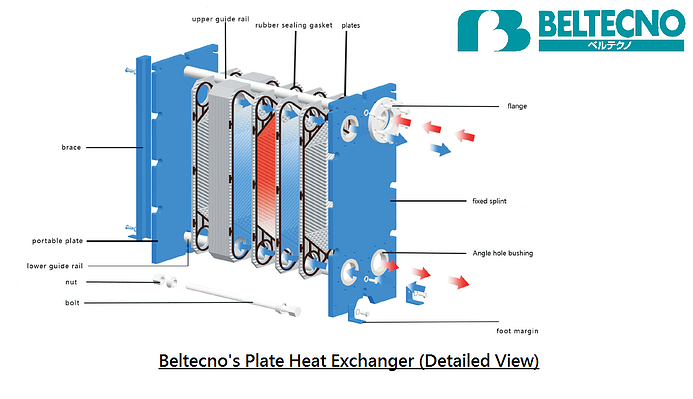 Basic Design & Working Principles of Beltecno’s PHE (Plate Heat Exchanger). Major points to remember before choosing PHE. Two pressure plates hold the pressure pack together with tightening bolts. Sealing gaskets sitting at the perimeter of plates, guide the flow of fluid alternatively to each flow channel. The plate and gasket material, size, quantity, etc. are determined by the medium flow rate, physical properties, pressure drop and temperature. A different design of corrugated plate structure not only increases the turbulence, but also the support points between the plates which can hold higher pressure. 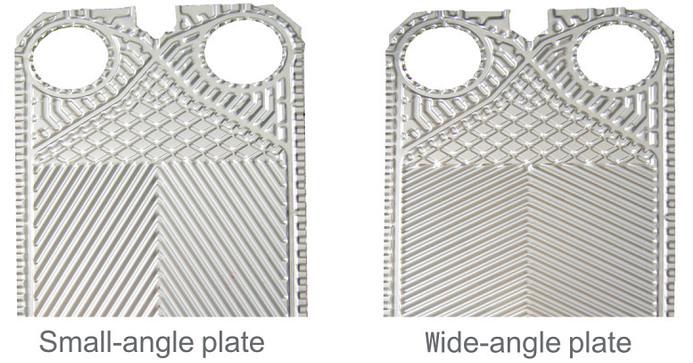 Diameter of Channel Plate- As per the application, we always need to recheck the diameter of the channel plate but of course, if the application of PHE is in an Oil & Gas refinery where long life is the priority, the diameter of the channel plate always plays a prominent role. Note- Optimization by mixing corrugated plates can improve heat transfer efficiency, optimizing pressure drop, requiring less heat transfer area which results in lowering the cost and shorter payback time. Pressure Drop – Pressure drop is a driving force in PHE’s, creating turbulence to get high U Value (Thermal performance is measured in terms of heat loss). In calculation, the pressure drop can dramatically change Heat Transfer Area required. So before finalizing the design of PHE we need to double check if the pressure drop could be increased! Fouling Factor – Fouling factor has become a very old topic of discussion for years. Research in the field of FF (Fouling Factor) has already proved that these values do not always give good results in PHE since they often result in oversized units with pre-mature fouling due to reduced velocity and turbulence. Heat Recovery- Heat recovery is the main reason to select a plate heat exchanger rather than another type of heat exchanger, such as shell and tube type etc. LMTD (Logarithmic Mean Temperature difference) = 1 is possible in PHE and counter current flow is also possible. Gasket Material selection- trying to find out the gasket material suitable for different fluids is not so easy. This fluid compatible chart can be referred, but also we have the following gasket selection table for common applications. Resistance to sulphur crude oil, mixed media with H2S, high temperature cooking oil lamp non-polar media. Heated water, Steam, food beverage, high temperature sterilization of milk. High concentration of sulphuric acid and other inorganic oxygen acid. Ref- Panstar heat-Exchange Equipment Co.Ltd. Plate Material selection –Plate material selection is related to fluids involved. Stainless steel is common material with water, but often Chloride level PPM is underestimated. The extent of fouling is low and less fluid retention. Compact structure and low investment, if compared with shell and tube type heat exchanger. If you are interested in our product Please feel free to write us at sales@beltecnoindia.com for more details on PHE you can download our product brochure. 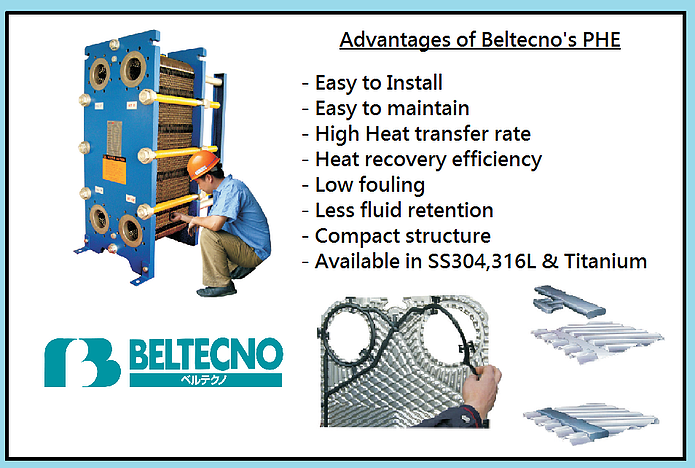 BELTECNO is a Stainless Steel processor and building equipment manufacturer. On the manufacturing side, we create equipment necessary for residential and business complexes, factories and plants such as Stainless Steel Panel Tanks, Hot Water Storage Tanks, Oil Tanks, Heat Exchangers and many others and so far we have provided services for a large number or clients. Stainless Steel is resistant to rust and is hygienic making it the best material for water storage. As it weighs about one-thirtieth of the concrete distribution site, it is a great advantage when installing a water reservoir on soft ground. Also, because it is resistant to rust, it is less prone to damage over time, leading to lower running costs. If you have any questions or inquiries about Stainless Steel Tanks, please contact us. 524A, 5th Floor, Tower B3, Spaze I Tech Park, Sohna Road, Sector 49, Gurugram, Haryana - 122018, India. 408, Prabhavee Tech Park, 4th Floor, Regus Business Centre, Baner, Pune, Maharashtra - 411045, India.